Walmart has always been one of my favorite stores to shop at. 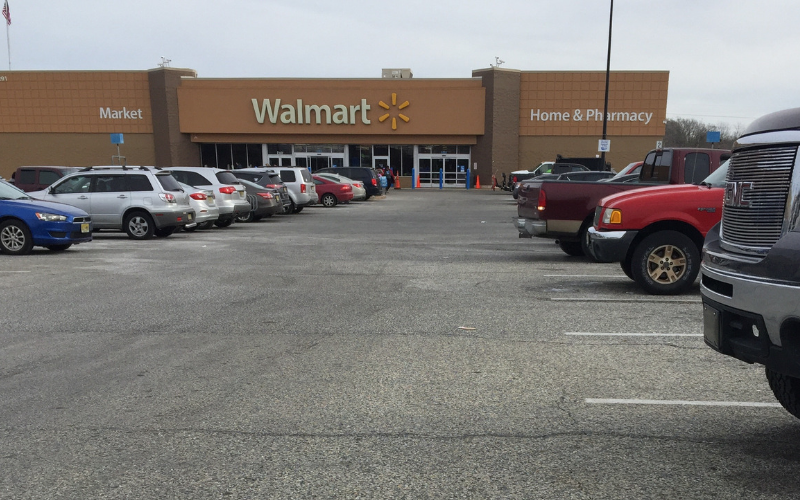 Did you know there are 5,358 different Walmart locations in the world? So many people choose Walmart because they have such low prices (even lower than Dollar Tree’s). It’s one of those places that carries pretty much everything you need so you only have to make one stop before going back home. When I got to the phone call that they wanted to interview me, I was completely stoked! Working at Walmart has been wonderful and I’ve gotten some great deals because of it. I’ve learned many tips for shopping by being an associate and I’m so excited to share them with you! I can’t go into this list of tips without mentioning the Walmart App. I will never shop without the Walmart App again! There are so many useful functions on it. I’m always surprised when I tell a customer about it and they refuse to give it a try. Because of this, I’m going to explain the awesome tools you can find on it. You must allow Walmart to access your location to use this function. When you’re at the store, open the Walmart App and the top will turn yellow and say, “Store Assistant.” From here, you can type in the item you’re looking for in the search bar and it will tell you which aisle to find your product. Also, it will be a quick solution if you’re not sure if Walmart even has what you’re looking for. If it doesn’t pull up under the ‘in your store’ tab, but pulls up under ‘Walmart.com’, then your store does not have that item. The Walmart App has a built in scanner. How awesome is that? It’s super convenient. Have you ever had a shopping experience where you couldn’t find the correct price? I know I have. Or maybe you find a random item another customer threw there. As long as your location is on, you can trust that the price will always be right. Some stores barely have any scanners left so be sure to make use of this amazing tool! This is what it looks like when you scan an item. The above product was thrown in the clearance aisle with no tag. We found a bunch of toy guns on clearance and took advantage! Working at Walmart, Walmart Pay is something I’m extremely grateful for. This tool allows you to link your debit/credit card to your Walmart App. Then, a QR code will pop up at checkout once the cashier clicks total. All you have to do is open this tool and scan the QR code. The transaction immediately goes through and your receive your receipt instantly on your phone. Isn’t that a wonderful way to go paperless? Plus, you’ll never lose your receipts again. They’ll always be on your Walmart App. This is one tool customers actually use without me telling them to. That’s because it’s great! Unfortunately, Walmart changed the Savings Catcher rules. Before, we were able to scan our paper receipt. However, now you must pay with Walmart Pay in order to submit your receipt. Nonetheless, it’s still functions the same and is still awesome. Relax while Walmart searches its competitor’s advertisements. If it finds a cheaper price for an item that you paid for, it will give you the money back on your account. Next time you pay with Walmart Pay, you can use the money you earned just by submitting your receipt. Does this work? Absolutely! I’ve earned over $30 in Savings Catcher. I’ve heard multiple stories of people who have earned over $100. That’s free money! As an employee, many customers have asked us how to look up a registry. There’s not a way for us in the store to look up a registry, but you can do it online. Either on Walmart.com or on the Walmart app, you can type in the name of the person who started the registry and find exactly what they’re looking for. Tired of waiting in that extremely long Customer Service line for a return? Now you don’t have to. On the Walmart App, you can start a return before you get to the store. When you arrive, simply go to the express line at customer service for extremely fast service. Check out this cool 30 second commercial that shows exactly how it works. Walmart Secret #1: I’ve heard that if you start a return for an item Walmart will just throw in the trash, there’s no need to bring it to the store. They will refund you for the item and you can just keep it. However, I’ve never tried it so I can’t be 100% sure. The following video talks about this. There are so many people who love to find great deals at Walmart. Plus, there are plenty of Facebook groups you can follow to become part of a community who searches and shares deals. This one right here is my favorite. If you don’t know anything about Walmart clearance, you’re in the right place. First off, clearance items aren’t beat up, old, and ugly items that no one else wanted. Usually, items go on clearance because new inventory is coming and replacing it’s location in the store. Therefore, the store tries to get rid of the item it no longer has space for by marking it down. For example, the toy department in my store just reset all their shelves and got in summer toys. In order to make space for all these toys, the previous ones went on clearance. We simply don’t have the shelf space for it. This is why after the holidays all the seasonal items go on clearance. There’s no longer room to keep all this Christmas, Valentine’s, or Easter stuff. We have to sell it fast. Other reasons items may go on clearance are: too much of the same item, a return from another store that isn’t sold at this location, a glitch in the system, or a home office markdown. Seasonal items always go on clearance once the holiday is over. There are people who come to the store as early as they open the next day (or midnight for 24 hour stores) to go clearance shopping. The awesome thing about working at Walmart is the clearance items continue to drop. Anything left over gets dropped to 75% off, then eventually 90%. I recently got me some awesome Christmas chapstick that was originally $1.00 for $.10. What a steal! This applies to all the gift sets, soaps, and anything else sent in specifically for Christmas. Every year, diapers go on clearance for half off just because they have a Christmas box. Isn’t that amazing?! People love to go clearance shopping after Halloween. They get all those big bags of candy for 50% off. It’s a great way to save big money: go shopping after the holiday. Get all your seasonal decorations while they’re on sale. As long as you have a great storage space, the next holiday will be awesome!! Walmart Secret #2: There are times when associates will print a shelf label on a clearance tag. These items are not on clearance. They are items that no longer have a spot on the shelf and need to be sold fast. The products above were found in the clearance aisle and had a clearance label. However, they are not clearanced items. Most clearance items end in $.00 or $.50. This is what real clearance labels look like. Clearance labels will always have a ‘was’ price. One of the reasons why I adore the scanner on the Walmart app is because associates sometimes miss price changes. This means an item may go on clearance and they won’t change the label. By scanning as you shop, you may find some unmarked clearance. I’ve seen countless stories of people who have found amazing deals just by scanning products. The CVP program is used to mark down items that are not on clearance. For example, you’ve probably seen these labels on produce packages, bakery items, or meats. These items are still cheaper than the original price and should at least be considered. The toy gun above was CVP’d because the package was damaged. (I hope it wasn’t a return.) However, the toy worked fine and there was absolutely nothing wrong with it. These items must not say ‘out of stock’. They have to be ‘sold & shipped’ by Walmart. A great way to tell if they’ll price match is to scan the item on the Walmart app. Once the price pops up, switch over to the Walmart.com tab. If the online price is cheaper, they should price match it for you. However, all store are different and I can’t say every store will honor the online price. Did you know that 4×6 1 hour prints are only $.25 each? Not only that, but sometimes they go on sale for $.19 each. That’s a great deal compared to some other companies. Walmart Secret #3: 1 hour photo prints don’t take one hour. Once you finish the transaction and unplug your device, it gets sent to the computer automatically. The only reason it may take an hour is if the store is receiving a large amount of photo orders. In smaller stores, there may be no customers in front of you and your prints will begin within 5 minutes. Did you know you can send prints to a store from the comfort of your home? Yup! You can go to Walmart.com/photo, upload your images, and choose which store to pick them up at. Yes, there’s another way you can send your images to their computer to print. You can download the Fujifilm Koisk Photo Transfer app. This app will allow you to choose the photos you want to print before you connect to the photo kiosk. Once you’re ready to upload, connect to the Kiosk by choosing your connection method. Then, insert the code on the screen into your phone and viola! You’re images are now synced. All you have to do is complete the transaction and click complete. Easy peasy! Depending on the price and time length, protection plans may be a great investment. These plans will replace any damaged product. The only thing it doesn’t cover is stolen or loss merchandise. Therefore, if your phone or tablet screen gets shattered or your headphones become water damaged, AllState will replace them or fix them. Some protection plans are only $7 for 2 years of protection. Why not? It’s better than buying a whole new one if it get damaged. Don’t take the broken item to the store. The stores don’t fix broke merchandise. Please keep the brochure they give you because you will need to enroll your product into the plan. There’s a number on the pamphlet to call when you want to file a claim. If your store has this amazing machine, then you can get free samples! All you have to do is download the Freeosk app and scan the QR code on the screen. They frequently change out the free samples. Walmart Secret #4: You can use the Freeosk twice in a row. First, scan the QR code and redeem your free sample. Then, text ‘FREEME’ to 51697. Wait for the text with your code, then enter the code onto the Freeosk screen. This will allow you to redeem the free sample twice. Woot! Woot! Many people do this weird thing where they grab the item behind the first one on the shelf. However, this is not a weird thing to do. So many items get returned to Walmart and can you guess what they do with them? They put them right back on the shelf in front of all the other products. Why would you want to buy an item that someone else returned. No thanks! Yup! You read that correctly. Not all stores have Grocery Pickup, but if yours does it’s an amazing thing! All you have to do is purchase everything you want from the Walmart Grocery App (or regular app) and select which location to pick it up at. Once you get there, follow the signs to the pickup location. Check in on the Walmart app (this tells the associates you’ve arrived). Park in the designated space and an employee will bring your groceries out to you. You also have the option to go in the store and pick up items if you prefer. Sometimes we have to go inside anyway (like to pick up a prescription). You can stop by the pickup counter on your way out to pick up your already paid for items. If the package to an item is pretty banged up, it won’t hurt to ask an associate for a discount. I’ve seen employees give customers a 10% off discount countless times. The worst they could say is no. If you find an item that is priced incorrectly, they may honor the wrong price for it. However, this is completely dependent on who the manager is. There is no written rule or policy stating that we must give the customer the item for the wrong price. Walmart Secret #5: Please be mindful with this tip. These incorrect pricing markdowns come out of the associates’ bonuses. Therefore, the associates actually get some sort of punishment for these price errors. I hope you thoroughly enjoyed this article. If you have any more questions please drop them down below. Also, please share this page with all your friends that are Walmart customers. Thanks for checking in! ← What Does The Word ‘Deliver’ Mean In Hebrew And Greek? So the summary of all this is, “Get out your cell phone.” I was a loyal Walmart shopper up until they shut many of us senior citizens out of the Savings Catcher program last year by REQUIRING you to have a smart phone to participate. When they began this discrimination against seniors and the poor, I started shopping elsewhere and have found if you shop specials at other stores, you save a LOT more than you do at Walmart. I still stop by to pick up a thing or two that I can get for less there, but save a load of money shopping specials at Publix and the produce is many levels above WM in quality and freshness.